Freebord – Snowboarding Minus The Snow | OhGizmo! 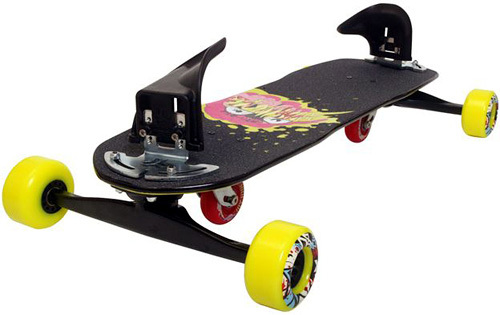 While the Freebord might resemble a regular skateboard, there are a few key differences that make riding it feel more like racing down a ski covered mountain than gleaming the cube. For one, the traditional 4 corner wheels are pushed out and away from the deck making them work like the edges of a snowboard which gives you more control over your speed when racing downhill. The other obvious difference is a set of center wheels mounted underneath the deck which are free to turn in any direction. They end up working like the petex base of a snowboard (the extremely durable and slippery bottom layer) allowing you to slide sideways while riding or even use them to ‘edge in’ and come to a stop. And while I’m sure the Freebord experience does probably come close to riding an actual snowboard, you’re unfortunately missing that soft layer of snow to cushion you when you fall. The Freebord Basic Setup kit which includes everything you need to get started plus your choice of deck is available from the company’s online store for $209.99. The freeboard has a hard learning curve but its worth it. Nothing comes close to the carving abilities of this board.